Piano Concerto No. 3 "Gift of Dreams"
My favourite of all year 2000's best releases that are important. (...) Ashkenazy leads stunningly cogent and expressive performances of two of the Finnish master's recent, and finest, orchestral works. (...) Ondine's breathtaking recording does full justice to the Helsinki Philharmonic's vivid playing. Thanks to the persuasive advocacy of these artists, (both works) cast quite a spell, in state-of-the-art sound. A piano concerto (...) that lifts you to ethereal heights. Eine ausgesprochen gelungene Zusammenarbeit zweier bedeutender Künstler auf der Höhe ihres Könnens. Good heavens, this is gorgeous music! (...) Rautavaara has come to be known not just as Finland's greatest composer, but probably the world's. It's a reputation effortlessly sustained by this release. First rate performances (...). Ashkenazy plays and conducts sympathetically. This CD contains Einojuhani Rautavaara's Third Piano Concerto "Gift of Dreams" (1998), featuring Vladimir Ashkenazy as soloist and conductor of the Helsinki Philharmonic Orchestra. Ashkenazy commissioned this work as a concerto which he could conduct while playing the solo part. Having performed the world première, he here delivers the concerto's first recording. 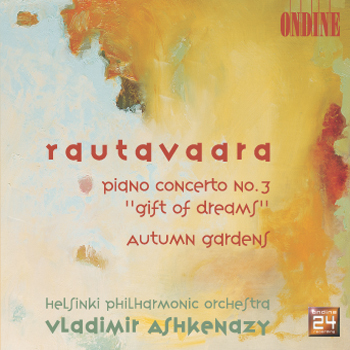 The concerto is coupled with Autumn Gardens (1999) for orchestra, and an additional bonus: a 13-minute conversation between composer and performer, revealing insights into their association, of which Vladimir Ashkenazy stated on the occasion of Rautavaara's 80th birthday in 2008 that, "It has been a particular pleasure and privilege for me to be associated with Einojuhani Rautavaara's music for the simple reasons that it is totally unpretentious and it deals with the basics of our existence. He never imitates, never tries to be deliberately original and he has an idiom all of his own. Combined with a very high level of professionalism, these qualities contribute to one of the most eloquent musical expressions of our time."